Well, that was interesting. Not quite what I was expecting. Let's cut to the chase and thank our lucky stars that Max Beesley and Zoe Tapper are in this series because they absolutely stole that episode from every other member of the main cast. Their relationship has been gently smouldering away since the first episode and indeed their secret identities have only been known to the audience at this point. Tom is a fascinating character. There is something so deliciously attractive about a man who is, by all intents and purposes, evil and yet seems to be aching for some sort of redemption. He's violent and frightening, has a possessive hold over the weaker characters and prowls around the situation like a big cat, toying with the group. It was perhaps a little obvious that as soon as a pregnant woman and a paranoid schizophrenic turned up in the series that Anya's cover would be blown. And I think Zoe Tapper absolutely delivered with her take on Anya's denial about the way the virus had snatched away all the people she had loved as well as the masses of patients she felt so impotent to help. By not being the doctor she obviously is, she's pushing away responsibility for the well being of her fellow men and women. Her redemption and the reassertion of her skills as a doctor were well written and sympathetically portrayed. She's also not afraid to challenge Tom about his homophobia, his ignorance and more to the point, his deep seated anger. Our Anya has found a little chink in Tom's armour and seems to have actually touched him judging by that sensitive holding of hands at the end of the episode. Beautifully played. Alas, one could not say the same for Julie Graham. I'm getting more and more disappointed by the Abby character, which may be the writers' fault, as she's overtly turned into a hand-wringing liberal who is a quite appalling judge of character. Graham wasn't particularly good in this episode except for the quiet little scene with Paterson Joseph where they both discussed their ties to the community. Paterson Joseph also needs a script that focuses on Greg as he is in serious danger of lacking any characterisation at all. Yes, I can see that the theme of not knowing anything about the total strangers you end up sharing your life with is central to the series but if they keep his background closeted any further I'll lose interest in him. Demonstrating Sarah's true colours as a possessive blonde twig was naturally going to occur and now that her nose has been knocked out of joint by Tom and his flirtation with Anya, I suspect she'll side with the next big lump of testosterone that comes along. Dexter, anybody? I also thought the love triangle between Al, Mike and Louise sensitively exposed more of Al's vulnerability and naievty. It was quite sad watching him wave Mike and Louise off at the end. Wasn't quite sure how the writer was going to play his cards when it came to the tricky subject of religion. At the top of the episode you could have been led to believe that this was going to be an examination and rediscovery of faith in a secular society seemingly punished by the wrath of a particularly recalcitrant God. There was a slight discomfort to begin with by showing us John, superbly played by Kieran O'Brien, as a voice hearing God botherer and the various reactions from our jolly band towards the arrival of his cult at the community. Were we going to end up with disgrunted Christians phoning up the BBC duty office complaining about how badly religious beliefs were being depicted and/or derided in a post-apocalyptic world? Or, likewise was it appropriate to align religious belief with a paranoid schizophrenic delusion? In the end, it managed to sway away from both areas and generated sympathy for poor John who was clearly, desperately ill. Linda, having brought her son into the world, exorcises those demons by showing her unswerving faith in John and her ability to simply love him in return for the care he had shown her. And not a God (other deities are available) in hearing distance. What disgruntled me was that John's 'followers' simply abandoned him at the end of the episode. Oh, so he's not got a hotline to God then? We're off and we're not helping to look after some mental bloke. See ya. A strong episode with some interesting character development for Tom, Anya and Al but little for Greg or Abby. 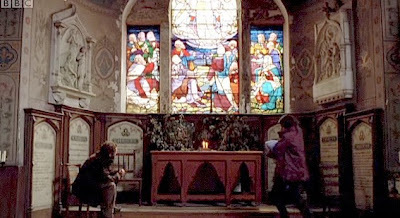 The treatment of religion was slightly bogus (certainly the original series had a fascinating episode By Bread Alone which examined a Church of England vicar's loss of faith in a post-apocalyptic world and how that faith is rediscovered) as we were really dealing with schizophrenia and how that could or couldn't be managed in such a world. That the mismanagement of such an illness is then framed within the environs of an abandoned church where Tom can no longer hear the voice of God suggests a subtext, although heavy handed, about how secular society itself no longer listens out for its chosen deity. It raises some pertinent issues that are worthy of those the original series managed to explore. Really enjoyed your review. I agree especially with your comments about Zoe and Max stealing the show, not just in their own scenes, but in the scenes they did together. For me, I think it's been very interesting to see how slowly but surely, sensitive and troubled Anya is taming the mad wild beast Tom - something I didn't really expect to happen judging by the way he brutally killed the prison guard in the first episode, and then lied about his identity. He is and always has been fiercely protective of our Anya - I just remember the way he threatened to break Al's neck if he made a move on her again in, I think it was the second episode. And the scary thing is, you know he meant it. The virus has given him a new chance at life, but he doesn't quite know what to do with it yet. He so easily reverts back to his old ways; look at the way he beat up schizo preacher, John. He would have damn near killed him if Anya hadn't have screamed out 'No!' She is changing him, slowly but surely, and their beautiful scene in the graveyard was something of an admission by Tom that she has and is changing him, even if Anya doesn't realise just how much. Tom is now a million miles away from the cold detached murderer we first encountered. I just pray that this powerful relationship comes to fruition in the next and last episode. I also can't help but wonder if Tom is actually going to come clean about his identity in the last episode, in such case, I somehow can't see him lasting out the season. It would fit somewhat beautifully into Tom's character journey if we saw him seek redemption through love. It's obvious he's falling hard for Anya, maybe he will sacrifice himself to save her life, seeking penitence for the man he was before the virus. That's a tremendously cool analysis of the Tom/Anya relationship, Anonymous. I don't think I could have said it better myself. You should take to reviewing as you'd be very good at it. I hope that the redemption of Tom continues. He's still very unsure about the feelings that Anya has produced inside of him. His cold carapace is now melting slightly. Let's just hope that the thaw continues into the last episode. Would the production team reveal Tom's true identity in what looks like a very crowded finale as it is or are they going to hold on to that to keep viewers interested for a potential second series? I am actually looking forward to the final episode which is a big surprise as I wasn't exactly enamored of the series to begin with.